Here are the top five advantages of having an executive suite of your choice with YourOffice Ballantyne’s virtual office solutions! Our executive suites feature an accessible location for your convenience. With 24/7 access, you can come to the office at any time that suits your schedule. South Charlotte’s prestigious location makes the perfect meeting space for your colleagues or clients. When you have the luxury of a private meeting space rather than a crowded café, you can make a better impression and more progress. 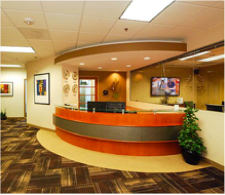 At YourOffice Ballantyne, we feature suites that can fit virtually any budget. Whether you need an office for an hour, a day, a week, or a month, we can accommodate your needs. Work in a productive space, win over a client, and have a separate business address with our flexible pricing options. When you don’t want to maintain a costly office space in South Charlotte, let our affordable options enhance your professionalism. We offer a variety of office configurations to suit your needs. Whether you need an office just for yourself or a training room for up to 40 people, our accommodations make professionalism easy and affordable. We even offer coworking space so you can have the flexibility to work in our common area which is over 8,000 square feet and includes charging stations, free beverages, and all the amenities of our corporate park location. One of the advantages of having an executive suite with us is the option to take advantage of our receptionist services. Our professional receptionists can answer your calls, transfer your calls to your cell, and even email you files of your voicemails to listen to at your convenience. We also feature a mail forwarding service, or if you like, you can pick up your mail from your private mailbox at any time. Our receptionist services are here for your convenience, so just let us know how we can help. At YourOffice Ballantyne, we feature amenities for you and your guests regardless of what office configuration you choose with us. Complimentary beverages. Enjoy tea, coffee, water, and soda on us. High-speed Wi-Fi. Never have to deal with a faulty internet connection again. 24/7 access. Come and work at any time that’s best for you. We keep you safe with our security professionals around the clock. We also offer all hardware you may need including printer, copier, and scanner. Our on-site and remote tech support helps you stay on task should an issue arise. When it comes to having an executive suite in the area, look no farther than YourOffice Ballantyne. We want you to have the most successful arrangement for your business. South Charlotte has so much offer—make your office here with all our benefits! Dave Taylor is a serial entrepreneur who has been running his own show for over 25 years. He has worked in lots of different environments and is currently the Owner/President of YourOffice-Ballantyne. You can get more from Dave on Twitter and Google+.